Eye floaters are shadows of the cell strands that are present in the vitreous of the eye. Though many floaters do no harm, there are some conditions in which an individual should seek physician help as it could symbolize benign diseases. Some floaters can also be signs of vision-threatening diseases. When the disease is diagnosed and treated, it can restore eye health and also cure floaters. Increase in the size of floaters. As we grow old, the gel-like vitreous that maintains the shape of the eye gradually liquefies. Some of the gel-like particles float in the liquid consistency, the retina casts shadows of these shapes, and we come across floaters. Floaters are most common in old age and are visible in lighter backgrounds. It might stay in the vision for a few weeks and when the brain gets adapted to seeing the floaters, an individual may not notice the floaters. However, if you are 40 years and above and if there are new floaters obstructing the ability of the vision, seeking help is necessary. 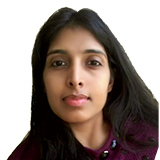 The gel-like vitreous will gradually shrink due to age and will detach from the retina. This is termed as posterior vitreous detachment (PVD). 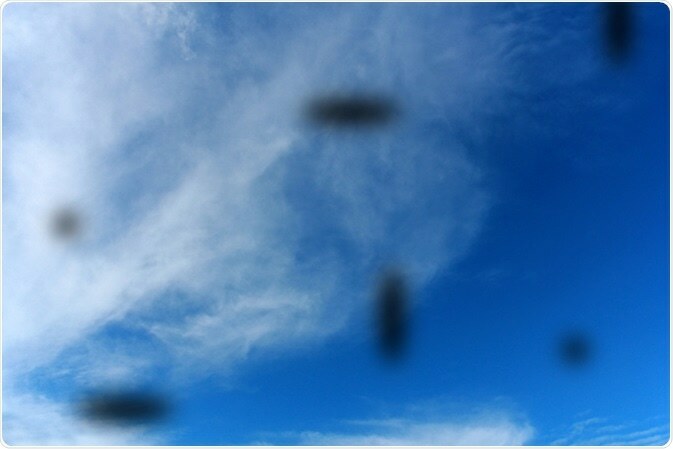 During the detachment process some debris will stay in the vitreous and they could be the cause of floaters. Usually, the size of the floater is large, like cobwebs that may block the vision. When the retina is separated from the supporting tissues, patients may not experience pain but will see spots and floaters, light flashes, shadow in the sides of the vision, and blurred vision. When experiencing these symptoms, consultation with a physician is important as retinal damage can lower eye vision. Sometimes, when the vitreous detaches itself from the retina, it can create small holes or tears in the retina. When the tear has disrupted a blood vessel it can cause vitreous hemorrhage. Under these situations, patients may report impaired vision and red or black spots. In some patients, the vitreous fluid flows through the torn retina and when the volume of the fluid increases, the retina will be detached. Individuals may experience a shadow-like floater when they come across retinal detachment in which the superior macula is involved. When the vitreous pulls itself from the retina, flashes are produced. Flashes are typically white, brief, star-like streaks and can be seen in dark and may or may not be associated with floaters. They appear on the sides of the vision. When migraines are the cause of flashes, the light flash episode will last for about 15–30 minutes. In the case of flashes related to retinal detachment, the episodes last for only a split second. This happens each time the vitreous pulls away from the retina and the light flash is stopped or may not be prominent when the vitreous is completely detached from the retina. 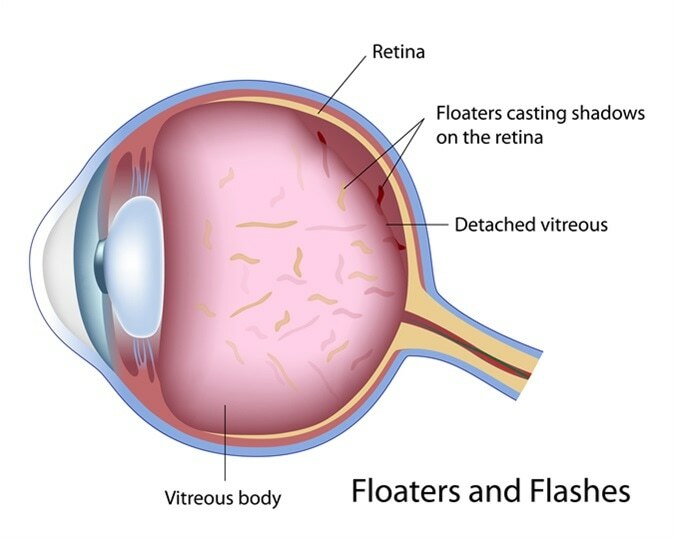 So when you see several floaters with or without flashes of light, it is a sign for an eye examination as the cause of the floaters could be PVD. Individuals who have undergone glaucoma or cataract surgeries, patients with retinal detachment in one of the eyes or with weak spots in the retina, eye injuries, and family history of detached retina are prone to retinal detachment. Myopia—a condition in which the eye cannot focus the light correctly, where images are formed in front of the retina rather than being formed on the retina, floaters are quite common. There are also some medical conditions that can cause floaters. It is important to treat these medical conditions, as if left untreated, they may cause damage to the vision. When there is inflammation in the eye, the structures supplying blood to the retina may be affected. Patients will experience sensitivity to the light, blurred vision, redness and pain in the eye and come across spots and floaters. Treating the affected structures will cure floaters as well. In diabetics, the high levels of blood sugar can damage the retinal blood vessels. In non-proliferative diabetic retinopathy patients, the tiny retinal blood vessels leak and the retina will be swollen. The exudated tiny particles can create floaters. Under proliferative diabetic retinopathy category, new blood vessels will grow and these delicate structures may break and bleed in the vitreous humor. Individuals might experience dark floaters when the bleeding is less; however, they may lose vision when the bleeding is more.